Jesus The Radical Pastor: Welcome, Lois! We have welcomed a new family member to our home. 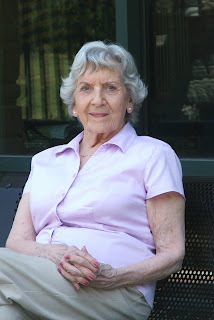 Lois Mays, Julie's mother, has moved from Nashville, TN to Grand Rapids, MI, to live with us. Lois was living with Julie's sister, Diane, and family. At 88, Lois is an avid reader and enjoys crossword puzzles and jigsaw puzzles. She was an excellent seamtress. When I started dating Julie in 1968 at Moody Bible Institute, she had the cutest clothes---originals made by Lois. Lois is one of four sisters--all who are still alive-- Phyllis, Lois, Julia, and JoAnn. Famously known as "the Porter girls." This past May, Lois was reunited with her sisters at a family reunion/wedding celebration in Nashville. Diane's youngest son, Jonathan married Grace. What a wonderful time with extended family. Julie counted 33 relatives all related to "the Porter girls." Walter Mays, Lois' husband, a Texas man worked many years for Ford, Inc., for LeTourneau Corporation, Marathon Corporation, and the Texas Crippled Children's Hospital. Walt (aka "Shorty") was the youngest of 9 brothers from Frisco, TX--enough for their own baseball team. He was a devoted Christian and helped found Village Bible Church of Hot Springs Village, AR. He died in August of 2000. Lois had 3 children--a son, Brian who died at the age of 35 of cancer. He was a neat man (who looked very much like Paul Newman). Brian was a civil engineer who owned his own business in the greater Chicago area. Brian was quite an athlete--in football (all-state quarterback) and in golf. Man, could he hit the long ball off the tee! We're glad Lois is part of her Michigan family now. Grandma, you look fabulous!! I can't wait to visit Mom & Dad and spend time with you. I think Lois looks stunning in that picture, too. We look forward to your visit, with Ben, Zach and Lil...and rumor has it that Bryan is coming. True?